With classes almost over, finals coming up, and graduation just around the corner, I decided to treat myself tonight–with a Mediterranean pasta dish. When you put garlic, artichokes, pasta, feta, tomatoes, balsamic vinegar, and zucchini together you get something pretty close to heaven. I get most of my inspiration from Pinterest these days, so naturally that’s where I found this recipe. I was led to this wonderful blog. The recipe was titled “Skinny Mediterranean Pasta.” Now normally I prefer recipes with tons of fat, but with my sorority formal tomorrow I didn’t want to take any chances. While there is skinny in the name, you wouldn’t know it! It was simply delicious. I’m a huge believer of good food that’s quick and easy–and this fit the bill. Boil some water for the pasta (you can choose any type of pasta you like! ), then saute artichokes, onions, tomatoes, zucchini, and garlic–I also added sliced olives and roasted red pepper–and cook those until tender. Then add balsamic vinegar and voila! toss it all together and serve with crumbled feta for that added touch. (That was a quick version of the recipe but here is the real one). I made a huge pan and almost ate the whole thing. I should treat myself to a leisurely, homecooked meal more often–cooking can be such a stress reliever. This recipe would be awesome chilled as well (maybe a lunch on a hot summer day??) 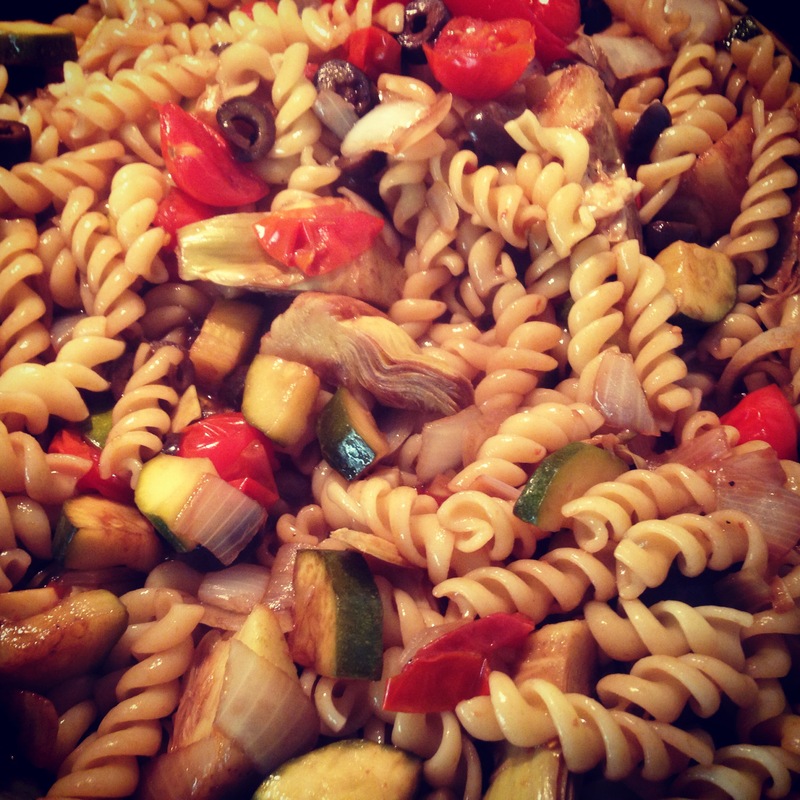 If you love pasta like I do, check this recipe out. But until next time, keep eating! I never thought I would like leeks as a breakfast food, but boy was I wrong. Brunch has to be one of my favorite meals ever. I could eat breakfast food all day every day (breakfast for dinner is absolutely the best). Having breakfast for dinner almost feels like you’re doing something wrong, since eggs are typically thought of as a morning food, but that’s what makes it so much better. The weather is finally getting nicer in Boston (HOPEFULLY no more snow….) so my friends and I planned on going out for brunch. The restaurant was in Boston’s South End, an area that is so cute and beautiful that I wish I went there more often. After finally finding a parking spot we walked to this small but absolutely outstanding restaurant: Aquitaine. The decor of the place was classy and elegant and their food was to die for. The one thing I appreciated was their ‘prix fixe brunch’ menu (because I always love a good bargain–especially when it comes to food). That included a fresh, warm, gooey cinnamon roll, bottomless coffee, orange juice, and an omelette served with breakfast potatoes and toast all for about 10 dollars. Talk about a DEAL. I ordered the mushroom, leek, and Boursin omelette–I practically licked the plate clean! I can proudly say I was a member of the clean plate club today–something I’m never ashamed to admit. There was the perfect amount of mushrooms and leeks to cheese. Everything was cooked to a T. Trust me it’s going to be hard NOT to become a member of the clean plate club. I would go back in a heartbeat and honestly probably order the same thing–(hmm maybe a different omelette just to be adventurous). If you ever have a lazy weekend and don’t want to cook for a change, I can’t recommend Aquitaine enough–kudos to my friend for finding it. But until next time, keep eating!